This study was carried out to determine the geoelectric response of water saturated and hydrocarbon impacted sand in the vicinity of petroleum pipeline. In carrying out this study, the electrical resistivity method was employed using the Wenner electrode array and the Dipole-Dipole configuration. Data were obtained from water saturated sand containing buried hydrocarbon pipe and water saturated sand impacted by hydrocarbon from the buried tank. The result of the study showed that the apparent resistivity of the area where the underground pipe containing hydrocarbon laid was higher than that of the water saturated sand not polluted by hydrocarbon. Result also showed that the area polluted by the petroleum leakage showed higher resistivity than that of the pipe and the area relatively far away. 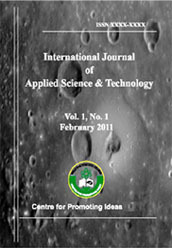 The two geoelectric techniques applied in this study showed similar trend hence both techniques can be used to effectively investigate pollution arising from underground leakages of petroleum pipes and storage tanks. The study has also shown that these two techniques can effectively determine the position of underground petroleum pipe.